Showing this weekend only at the Kew Bridge Museum Made @ Kew Bridge is the work of 15 talented artists. The exhibition includes paintings, ceramics, jewellery, furniture, sculptures, miniatures and blacksmith forged pieces. The works are exhibited among the wonderful steam engines of the museum. 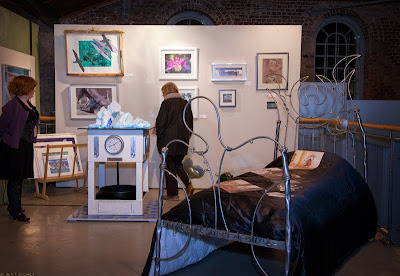 Several of the artists workshops and studios are situated next to the museum and will be open to visitors this weekend. The works in the exhibition are fabulous and combined with a chance to see the artists at work makes this a great opportunity not to be missed - only on this weekend. Nice! I'll like to see this exhibit. I have to go to an art show. I enjoyed them once upon a time. and went to shows to sell them. so I could buy her a matching dryer. Those were the days when art shows were very important to me. Your post brought all of that and the smell of turpentine back to me. This sounds like a wonderful way to spend a Saturday. I miss living in a place with exhibitions. That looks really interesting! It's the sort of exhibition I would enjoy visiting. I love to see a craftsman at work. Sweet dreams indeed in that bed!